We went over to the Big Island for a week of “cillaxing” in February. Staying in a condo, we enjoyed several long drives around the island to visit the Volcano National Park, Hilo and the north end. Weather was up and down, the second night a huge storm blew through with pound rain and wind. But in the tropics the weather changes pretty quickly and we had as many warm sunny days as overcast or rainy. 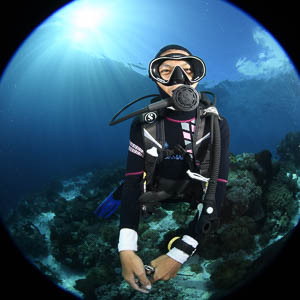 Denise caught a cold, but I managed to get out with Jack’s Diving Locker on one of their limited load trips one day. They did a great job with only 4 divers on a boat made for 8 or 10, for photographers it’s well worth the extra cost. Unfortunately the swell was running, so options for dive sites were very limited. The first place we went to really had little life, although the old lava flows underwater were pretty interesting. One the way back we did a dive at Captain Cook’s Bay, where he was killed. Although there were a lot of day boats with snorkelers, we enjoyed the huge coral slopes and pretty had the site to ourselves. It was a nice day on the water with whales rolling around us on the boat on the way back. I went up the “Sanctuary - 2 step” for a shore dive one afternoon and really enjoyed it, lots more life and good macro subjects nearly everywhere. 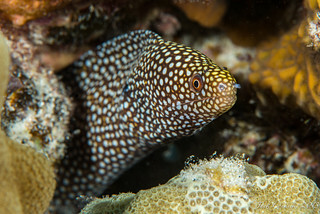 Spent quality time with a little jeweled moray. Even spotted a turtle (of course with a macro lens couldn’t get much of a shot). As it is a protected park, the fish life there is abundant. I also went with Jack’s on one of their famous Manta Night dives. Having done several trips to the Socorro’s with the giant mantas, I wasn’t sure what to expect amid all the hype. But it turned out to be as exciting and fun as it was built up to be. We had something like 29 mantas show up and swoop close up over and around us from all directions, feeding on the krill that had gathered in our lights. I kept getting some weird reflections from some of the bright dive lights in my dome port when I was shooting stills, but my video turned out pretty well. Definitely a must do. Kona provided a lot of good photo subjects that week; big and small. 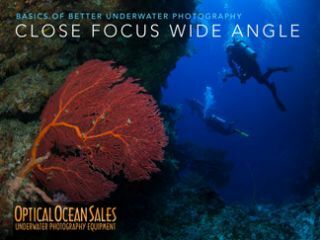 Kona Manta Feed from Optical Ocean Sales on Vimeo.